Can chanterelle mushrooms take the stains out of silk? Might elderberries dye yarn blue? Will scented rose petals make an artisan’s linens smell like those of a great lord? 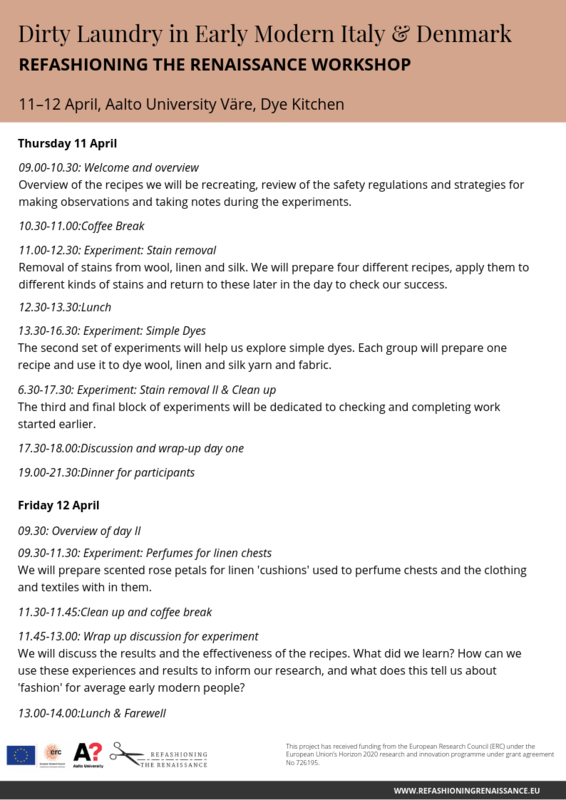 On the 11th and 12th of April 2019 the Refashioning the Renaissance team and two external experts will explore these and other questions by recreating early modern recipes for cleaning and dyeing clothing and textiles. Looking to the Danish and Italian contexts, we have specially selected recipes that appear repeatedly in cheap and easy-to-obtain texts and pamphlets from the early-sixteenth century well into the seventeenth century and beyond. These texts were intended for use at home; they feature terse instructions and call for ingredients that were relatively easy for people to obtain, some of which may have even been growing in domestic gardens and pots. Some scholars have also suggested that many simple recipes recorded in printed and manuscript texts were based on folk practices that people carried out as part of their everyday life. This is especially true for girls and women from the lower social orders, who were likely to work with textiles at home but were rarely able to read; they learned from observation and experience rather than from reading books. We will be following instructions for removing stains, dyeing yarn and making scented sachets for linen chests to see if these popular recipes actually worked. 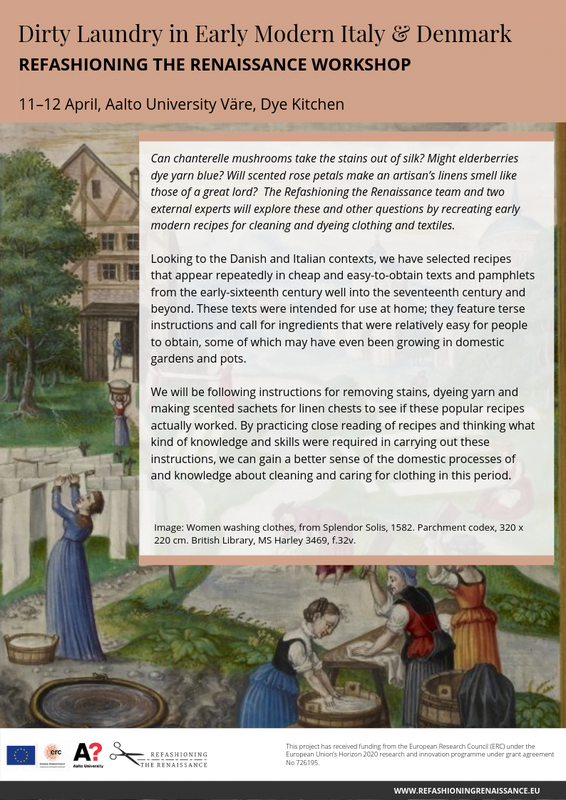 This in turn will help us understand some of the practices that working people in early modern Italy and Denmark might have carried out at home to care for, clean or refashion their garments. Recreating recipes also demands close reading and that we think carefully about what kinds of knowledge and experience they assume the reader already has. This may help us confirm that these books and recipes were indeed intended for regular people rather than professional dyers, for instance. It also gives us insight into the kinds of knowledge and experiences that regular people had, which is hard to trace in this period given the low-levels of literacy, especially for women, which meant thoughts and practices were not usually recorded. 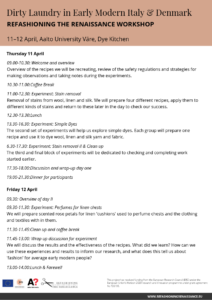 In sum, by recreating early modern recipes, we will see if they result in what was advertised, and hopefully gain a better sense of the domestic processes of and knowledge about cleaning and caring for clothing in this period.